We’ve previously talked in detail about Substratum and why it works on Samsung’s devices running on the official Nougat firmware from the company. It’s a happy coincidence if you happen to own a Samsung device running on their official Android Nougat firmware. Substratum support opens doors to a level of customization that you normally won’t get on a non-rooted device. But thanks to the Substratum team and a little coincidence, you can theme your Samsung Galaxy device as if it had a custom ROM installed. Today we’re going to show you how you can take advantage of this and change status bar icons on your Samsung Galaxy S8 and Galaxy S8 Plus. To do this, we’ll be using the Substratum theme engine and thus require a substratum theme that can change the status bar icons. Lucky for us, developer OhayouBaka has already created such a theme that you can download and install from the Play Store for free. 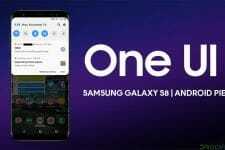 Although the theme has been made to use on the Samsung Galaxy S8 and S8+, it should work on any Samsung device running on an official Nougat firmware from Samsung. You will of course also need the Substratum theme engine installed on your phone as well. Even though Samsung Nougat devices contain a lot of similar code that does not automatically guarantee Substratum compatibility. That is because Substratum was originally meant to be used on AOSP based ROMs and not heavily modified Samsung ROMs. 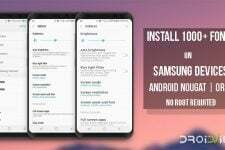 Therefore, to make substratum work on Samsung devices, the team behind the popular theme engine created an Addon key to enable Substratum themes for Samsung devices. Download and install [Substratum] StatusBar Icons (+extras) for Samsung, Substratum Theme Engine, Substratum Integration for Samsung (Addon Key) from the Play Store using the links above. Open the Substratum app and grant the application the proper permissions. Read and dismiss the warnings and you should see the installed Status bar icons theme front and center. Tap on the theme and select the overlays you want to install. When you’re done tap on the floating action button at the bottom right and apply the selected layers. When done, reboot your Galaxy device and when it comes back up, you should be seeing your new overlays. I tried this on my Galaxy S6 and it was successful for the most part, but I don’t have a dark theme like you, mine is still white and blue (ugh), do you have any tips on how to make it like black and white like yours?